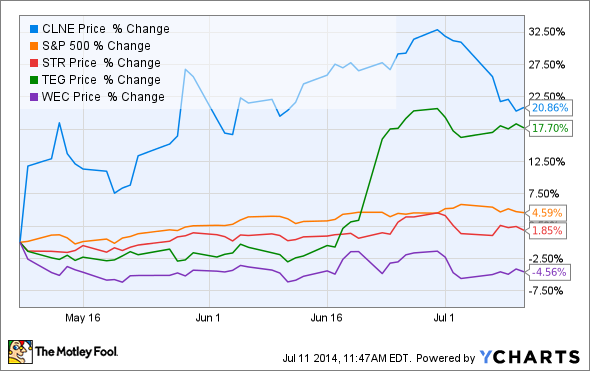 Why Is Clean Energy Fuels Down Almost 10% in July? After a strong run, Clean Energy Fuels shares have fallen sharply in recent weeks, and on essentially no news or information. What gives? Is competition from Integrys Energy Group -- which has agreed to be acquired by Wisconsin Energy Corp.-- and Questar Corporation spooking the investor world? Since early May, the stock has been performing well; so what's got the market spooked? There really isn't any news of note out there beyond a few press releases about new station openings, and expanding agreements with existing customers. Is Mister Market growing concerned that Questar Corporation (NYSE:STR) and Integrys Energy Group (UNKNOWN:TEG.DL) -- which was recently acquired by Wisconsin Energy Corp (NYSE:WEC) subsidiaries Questar Fueling, Questar Gas, and Trillium CNG, which are better capitalized and stronger financially -- will pose a bigger threat than anticipated? Buy, sell, or hold? With earnings just a few weeks away, what should investors do? Let's take a closer look. As you can see in the chart above, Integrys Energy Group's stock is up 18%, due to the fact that Wisconsin Energy Corp is acquiring it and consolidating a lot of the operations together. Integrys had previously announced that it was also divesting itself of Integrys Energy Services, which is one of its non-regulated fuel and electric marketing businesses. I bring this up because it's not 100% clear what the new company, which will be called WEC Energy Group, intends to do with nonregulated subsidiaries like Trillium CNG. As it stands now, Integrys has committed $121 million in capital expenditures to Trillium during the next three years in order to reach the goal of at least 100 natural gas refueling stations by the end of 2016. Frankly, until the integration of these two companies is complete, which could take a considerable amount of time, it's hard to predict exactly what will happen with Trillium. Management made it clear in the press release that the dividend is the focus. Before the buyout sent Integrys' stock up, it yielded more than 4.5%, and management said in the press release that it would keep the dividend "neutral" for Integrys shareholders in the new company. This means that it would be increasing the dividend versus the dividend paid by Wisconsin Energy Corp. While I'm not willing to make any predictions, it would seem reasonable to expect the new WEC Energy Group to toe the line on Trillium CNG for now. Questar is a threat because it operates both a regulated natural gas vehicle refueling business as part of its regulated Questar Gas in Utah and Wyoming, and Questar Fueling, its unregulated subsidiary, which can operate beyond the regulated limits of Questar Gas. As a fully integrated producer, distributor, and marketer, Questar Corporation is deeply involved in essentially every section of the natural gas value chain. Whether this pays dividends in the long run as a competitive advantage remains to be seen. To date, Questar Gas owns 29 stations in Wyoming and Utah, for a total of approximately 60 stations in this territory. As of May, Questar Fueling had two stations open, with another seven scheduled to be completed in 2014. What about Clean Energy Fuels? Competition is a reality in any good business opportunity. It's also validation that the opportunity is real. The thing is, it's tough for regulated utilities to grow, especially in developed countries like the U.S. This is why you see Wisconsin Energy Corp. acquiring Integrys Energy Group -- there just isn't anywhere to expand the business beyond a burgeoning industry like NGV refueling. Beyond that, it's important to remember that these utilities aren't getting into this business to lose money, so the expectation that they'll have pricing power over Clean Energy Fuels isn't realistic, either. Frankly, the playing field is relatively level when it comes to wholesale gas prices. Clean Energy Fuels' public stations include 28 LNG stations already open. Source: Clean Energy. What is different about Clean Energy Fuels' offering versus its utility brethren is that Clean Energy is bringing a suite of offerings to the table, including compressed natural gas, or CNG, liquefied natural gas, or LNG, and Redeem, its brand name for renewable natural gas, or RNG, which is produced at landfills and from other sources of biowaste. To date, its competitors are only offering CNG, which, while being a compelling fuel for a lot of applications, doesn't meet the needs of every industry or application. This competitive advantage for Clean Energy Fuels is very real, and a positive that investors should seriously consider. During the past year, others -- with dubious intent -- have written that Clean Energy is betting on LNG, while ignoring that it is also the largest supplier by far of CNG for transportation in North America, and this part of its business is growing at a 20% rate. The stock was pushed up sharply a few months ago by both a strong earnings report -- fuel deliveries were up more than 20% across the board -- and an analyst upgrade. Since then, the only news has been the opening of several more LNG refueling stations, and refueling agreements with existing and new customers, in both CNG and LNG. Management has also said that the margins they are seeing should substantially reduce losses going forward -- largely a product of heavy investment in new station construction. In short, the stock's not down for any "real" reason. It's just down. As to Questar Corporation and Integrys Energy Group's and Wisconsin Energy Corp's soon-to-be WEC Energy Group, these are solid plays for investors looking for consistent and predictable income streams, but not sources of growth. As to their posing a threat to Clean Energy Fuels? I don't buy it at all.